Yellowhead IPA is a ‘Session IPA’ that combines tropical, fruity NZ hops and a light, drinkable malt body. An exuberant fruitiness presents a sharp aromatic nose of NZ hops and pineapple character that is carefully balanced by a light, biscuity maltiness. Water, NZ Barley, NZ Wheat, NZ Oats, NZ Hops, Yeast. 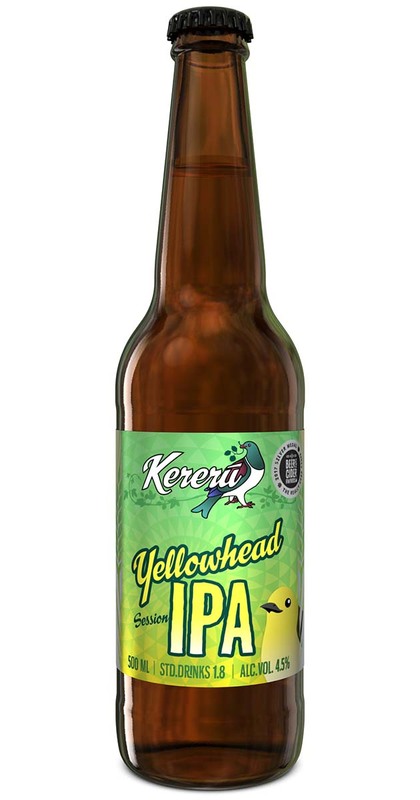 Developed for the 2016 West Coast IPA Challenge, this sensible and sessionable IPA has been a winner with Kereru fans! It has oats added to it for additional body and to make it feel bigger than the modest 4.5%ABV. A favourite with our brew team!